When it comes to extrusion and fabrication of aluminum, there are unlimited options available to manufacturers who need parts, products, and components that will fit and perform according to specifications. Original extruded aluminum profiles can be designed and created to meet any number of requirements, but it pays to work with a service that has the knowledge, experience, training, and equipment to get the job done right. Silver City Aluminum has earned a solid reputation for producing top quality custom aluminum extrusion. Our aluminum extrusion profiles are made using strong and durable aluminum alloys and are designed to meet or exceed your expectations. At Silver City, our team of engineers and technicians can work with you from the early stages in development to help create the desired results. We have discovered that the sooner we can start working with customers to develop custom profiles for extrusion and fabrication, the more satisfied the client is at the end of the project. We have proudly served customers for standard and custom aluminum extrusion in the northeastern region for many years and have even shipped our aluminum extrusion profiles to customers across the country and around the globe. We are your one-stop shop for quality profile design, aluminum extrusion, fabrication, secondary operations, and finishing. The tool used to create the desired shape out of extruded aluminum is known as a profile or die. It is made from a solid steel construction and is designed according to the customer’s specifications. The profile is used to help forge a custom shape during the extrusion process. Durable steel is used for the die so that it can be used again and again to fill the client’s order. 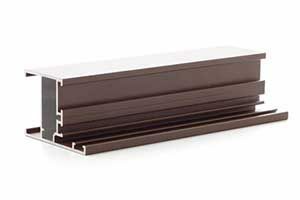 Extrusion is the process that is used to create custom shapes from aluminum extrusion profiles. The raw materials, which can be made up of a variety of different aluminum alloys depending on the needs of the client, are heated and forced through the die to create the desired shape using extreme pressure. At Silver City Aluminum, we use materials that are made up of 99.9 percent recyclable aluminum. To minimize scrap and reduce costs for our clients, we cut the seven-inch diameter billets of aluminum alloy into the proper size, based on the length and weight of the profile. We pre-heat the billets by loading them into a long oven. This prepares them for the extrusion press and allows us to bring them to a specific temperature to provide the best results. The metal is pushed through the aluminum extrusion profiles at 10,000,000 pounds of pressure, so it will flow through the steel die to create the exact shape that our client has designed. This same process is used for standard extrusion and fabrication as well. The extruded aluminum is placed on a 160-foot table to be stretched into the perfect dimension while it is still warm. We do this with opposing stretchers. The metal is then cut according to the specified length and heat-treated to harden the aluminum to its maximum capacity. Clients who contact us to create custom aluminum extrusion shapes can send their order to us using 2D and 3D file formats. AutoCAD, which is a very common and familiar software program used by designers across many different industries, is used for 2D rendering with .dxf and .dwg file types. Inventor, Solidworks, and other popular 3D software programs that use file types that include .stp and .iges are also acceptable. We can also take Adobe Acrobat .pdf files and scanned documents that provide the necessary dimensions required to redraw the shape accurately in a CAD program. New clients and existing clients who want to create original aluminum extrusion profiles can work with our team of engineers and technicians to design a custom aluminum extrusion shape. Our many years of experience and knowledge of the materials can help customers to maximize the results of each profile. Insight and tips can help to overcome common issues with tight tolerances, help create interlocking joints, and even learn how to avoid surface defects. Slight changes in design can make assembly of completed extrusions to function even better. If you would like to learn more about designing aluminum extrusion profiles or would like to place an order for standard or custom aluminum extrusion, contact our team at 508-824-8631. Located in Taunton, Massachusetts, Silver City Aluminum provides top quality extruded aluminum to customers all across the country and around the globe. Contact our team for a FREE estimate on your next project.